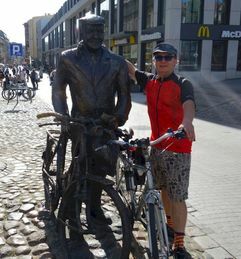 I have already cycled with many of you in the past years - in southern and eastern Poland, in our neighbouring countries: Slovakia, Ukraine and Belarus. 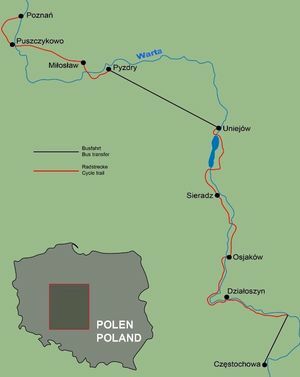 Why don't we cycle to some other regions in Poland, the county I come from? How about around Poznan and along the Warta River, which is the third longest river in Poland? It was my pleasure to invite you to a trip in July 2017 and again I would like to invite you in July 2018. I think this would give my regular customers, particularly those who might already have been on all the trips we offer, a good opportunity to cycle with Bird Service once again. This is the opportunity to make many new and unexpected discoveries. Apart from romantic landscapes, small towns, palaces and castles, buildings of religious significance, I promise you memorable wellness and gourmet experiences in carefully selected hotels. You will have the chance to swim every day - either in a pristine river, in lakes or in a hot spring. The tour is not difficult - the route is flat and there will be a vehicle accompanying us. Here are some photographs and the programme. I'm excited about the tour and look forward to your hearing from you! I would recommend a flight to either Katowice or Krakow. I would be offering a transfer from the airports of both these cities in the afternoon. You could of course, also come a day earlier and spend the night in Krakow. A tour of the Jasna Gora Monastery (famous place of pilgrimage) founded by Pauline monks and a short bus ride. We start cycling at confluence of the Warta and Liswarta rivers. The upper stretch of the Warta is of rare beauty! It is crystal clear with a sandy riverbed and forested banks and it forms a 180 degree loop. The next two legs of our tour follow the course of the river towards the north. The landscape on the way is typical of former Congress Poland - the area belonging to Russia in 19th century as decided by the Congress of Vienna - with small fields and meadows in full bloom. 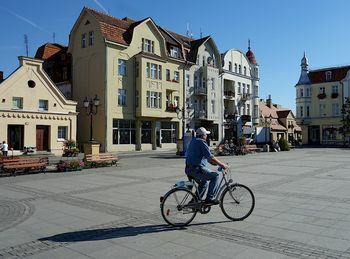 Sieradz is one of the oldest towns in Poland with a beautiful market square. The tour takes us past the large Jeziorsko reservoir to the Uniejow, a small town with a palace dating to the 14th century, a palace garden, hot springs and a modern wellness oasis. The Warta now flows westwards. We travel the first 80 km by bus. This leg of our tour begins in Pyzdry. The border between Prussia and Russia ran through Pyzdry up until 1914. We visit Smielow Palace, a building in Classicist style, and come to the virgin alluvial Czeszewo Forest. We spend the night next to a romantic palace garden in Miloslaw. I am particularly proud to be able to introduce you to my home city of Środa Wielkopolska. The city centre with a market square dating back to the Middle Ages has been well maintained. A 12 km long narrow-gauge railway leads to Zaniemyśl. We go on past a series of lakes (we could take a break to go swimming) to Puszczykowo, a forest health resort in Wielkopolski National Park. Our trip finally ends in Poznan. This is the capital of Wielkopolska (Greater Poland) and it has innumerable places of interest, such as the most beautiful Renaissance town hall north of the Alps or the former Imperial Palace. The region has become exceedingly cycle-friendly and there are cycle paths that go through recreational areas at Lake Malta and to old Prussian fortifications. Day 9. (Monday 30.07.) End of the tour. End of the tour. 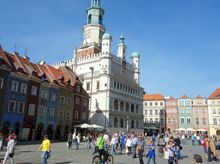 You could either stay on in Poznan, return home from here or even return to either Krakow or Katowice (return transfer is free of cost). Tour date 2018: WAR-1 22.07. - 30.07.